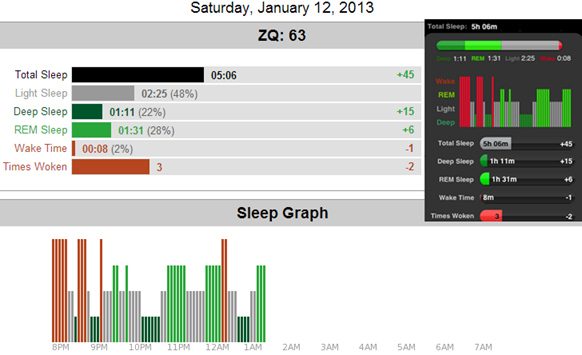 I did not log my sleep for the Saturday span, as due to a blackout my Zeo was not charged. I believe that I only got about 6 hours of sleep in total for Saturday due to another hot day. I then met a few friends and finally worked so did not get a chance to nap in the afternoon for a sleep recharge. I think that I need to create a viable schedule for Saturday and Sunday as both days are still causing me problems with this new program. 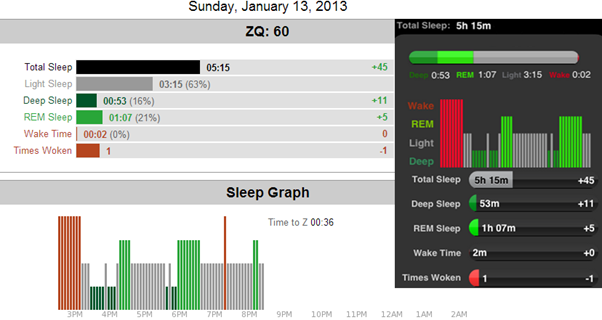 Sunday and Monday night were both interesting nights of deep sleep. At the beginning of this experiment I had a goal to maintain my percentage of deep sleep. Interestingly my deep sleep percentage through this experiment has increased in proportion to my REM sleep units. To adjust myself back to my daily schedule, I tried taking two 20-minute naps in the afternoon on Sunday. The first nap was more successful than the second. I’m not sure that these naps are helpful yet because I need to lower my time to sleep. Currently it is still taking me 20minutes to fall to sleep. So, that means 20 minutes to sleep for a 20minute nap, and is not benefiting me enough for time maximization. This morning I have been feeling a lot more tired than normal. Which I have credited to my lack of napping over the weekend. I had originally intended to wake up at 6am; however, slept through my first alarm and ended waking at 7am. After almost 1 and a half hours of being awake so far this morning I am still tired and unmotivated. I am going to plan a nap for midday today to overcome this tiredness. Hope it helps.